We recently launched our fabulous Gemini Cut On Edge dies – giving you plenty of crafting options. 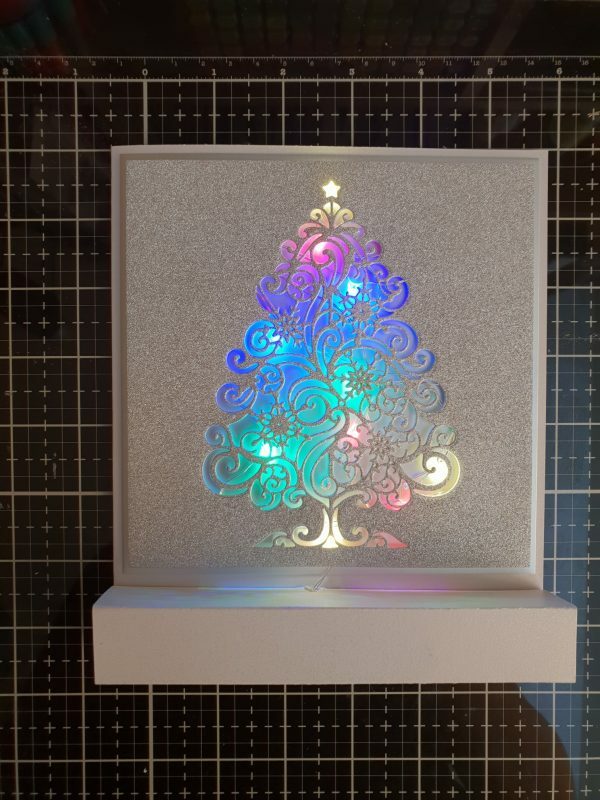 Now here’s a concept that will really bring your project to life… Add some twinkling lights and make a decoration that can be displayed for many Christmases to come. 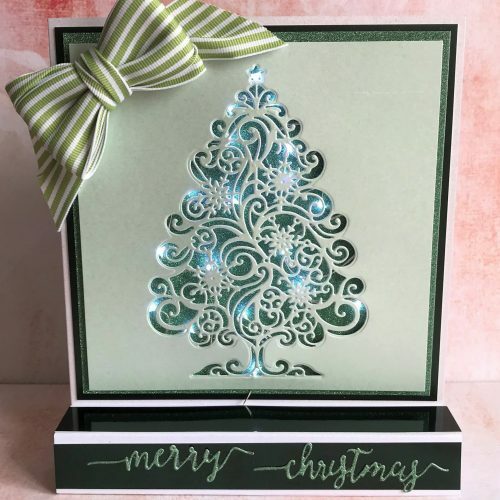 Thanks to Nicole Preston for providing this super tutorial! 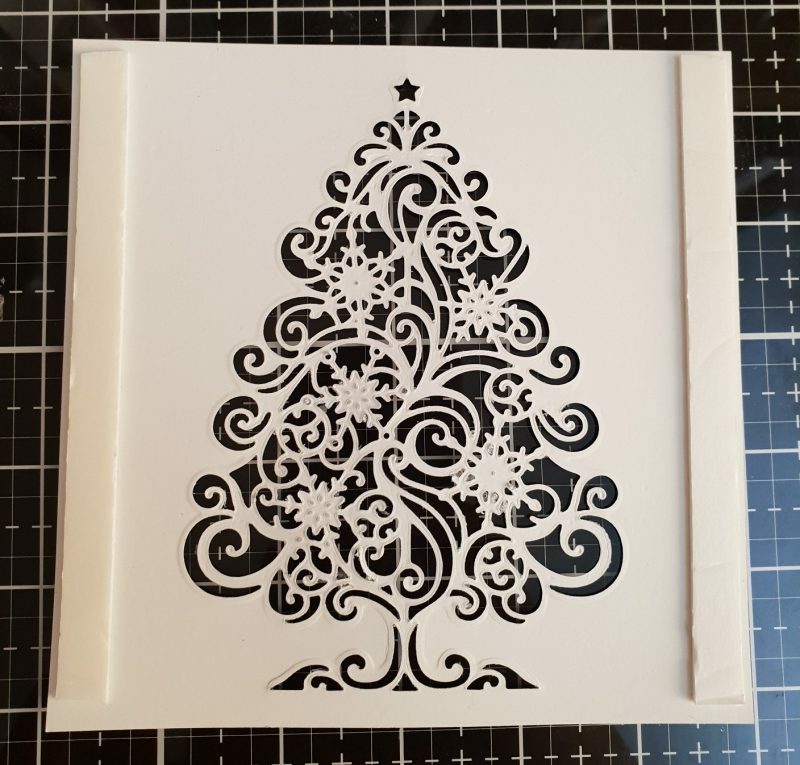 Using the big score create a card black which measures 6 ½ inches x 7 ½ inches. Make sure the score line is on the longer edge. 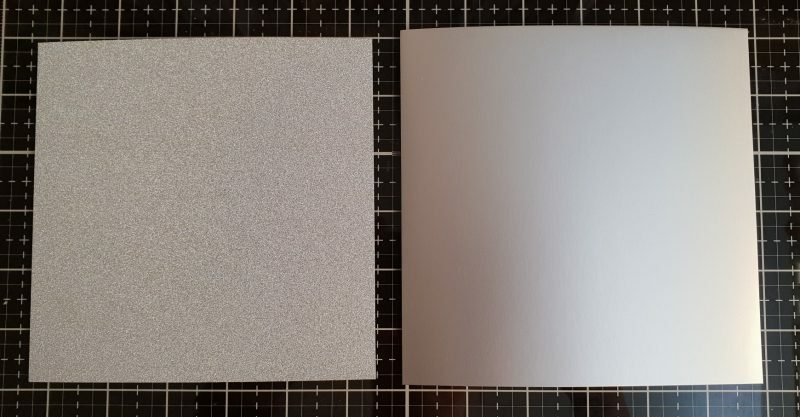 Cut the 2 mats which will place on top of the card. One at 6 inches and one at 6 ¼ inches. You need to cut the detail die out of the smaller of the 2 mats. Line the die up centrally so that it fits and have a thin border, this will allow for the wires to be hidden. Now working on the reverse of the die cut image place 2 strips of foam tape. Place the Christmas tree to one side. 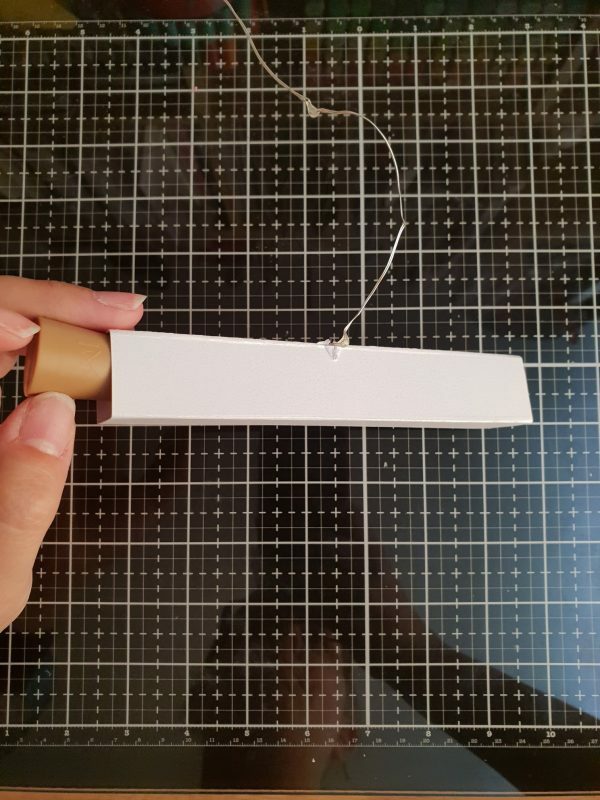 You now need to create the box which will house the cork light switch. 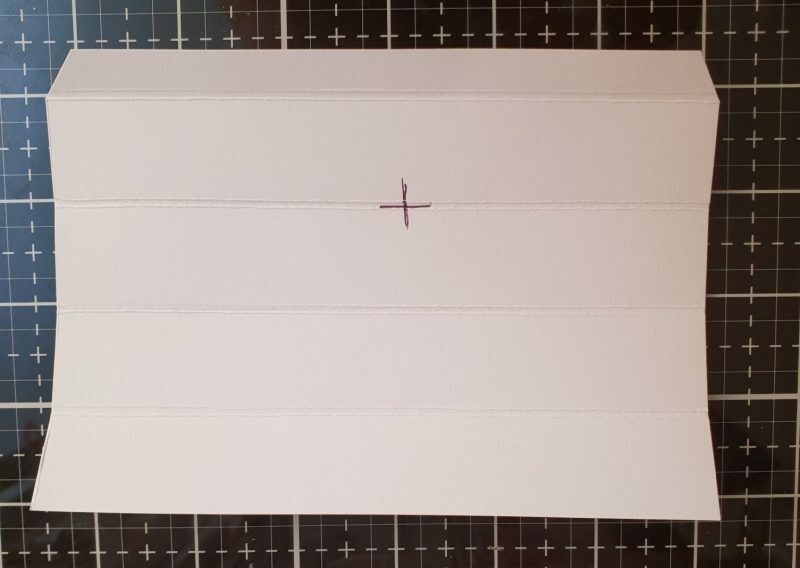 Cut a piece of card from Centura Pearl which measures 4 ½ inches x 6 ½ inches. Place this on the score board and score at 1 inch, 2 inch, 3 inch and 4 inch. Use a bone folder along all of the fold lines to make the folded edges crisp. Then flatten out and draw a cross as shown in the image. Use your craft knife to create cut lines on this cross. Try to make this line as central as possible but it doesn’t matter if it slightly off. I did not measure mine. 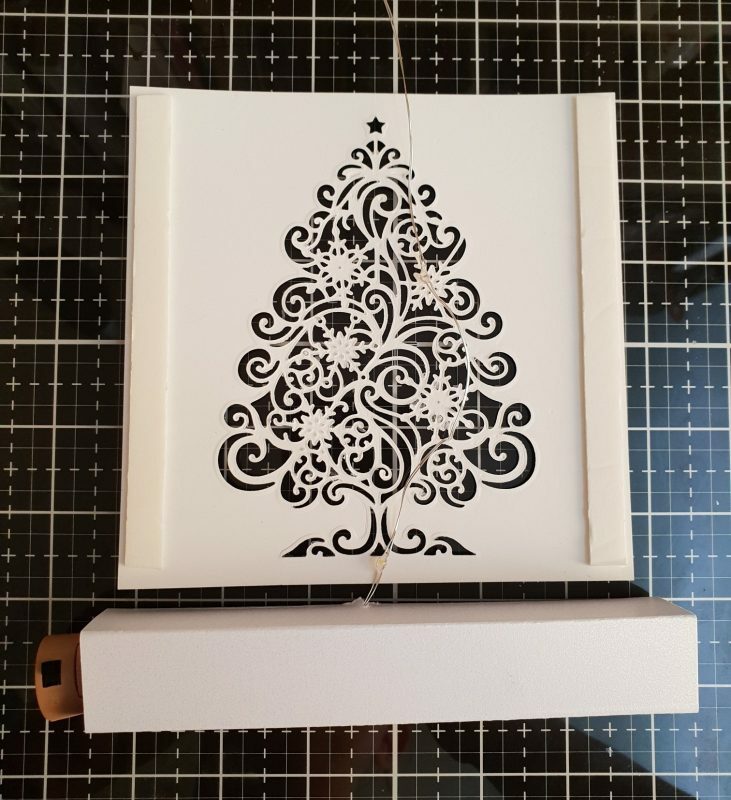 You now need to thread the lights through the card so that when you stick the box together the cork element is hidden. 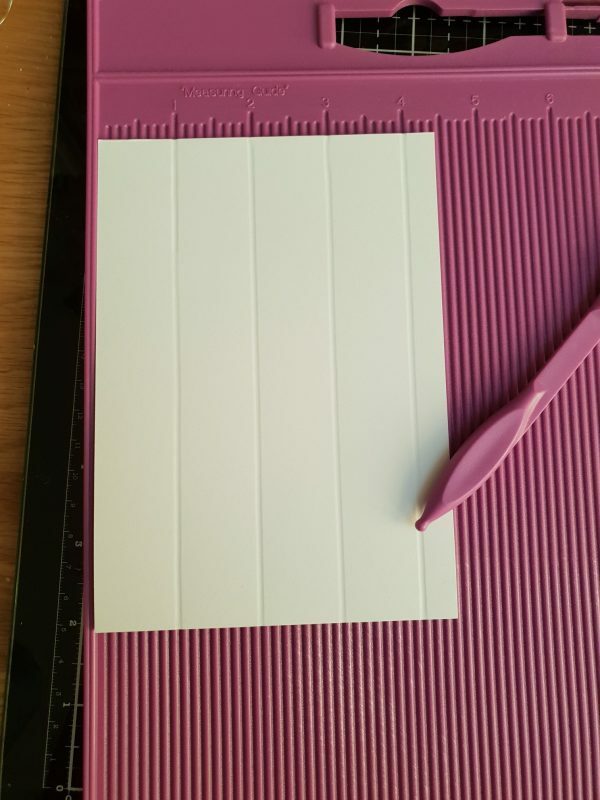 When you go to stick the tab to create the box shape you should use the tacky glue. 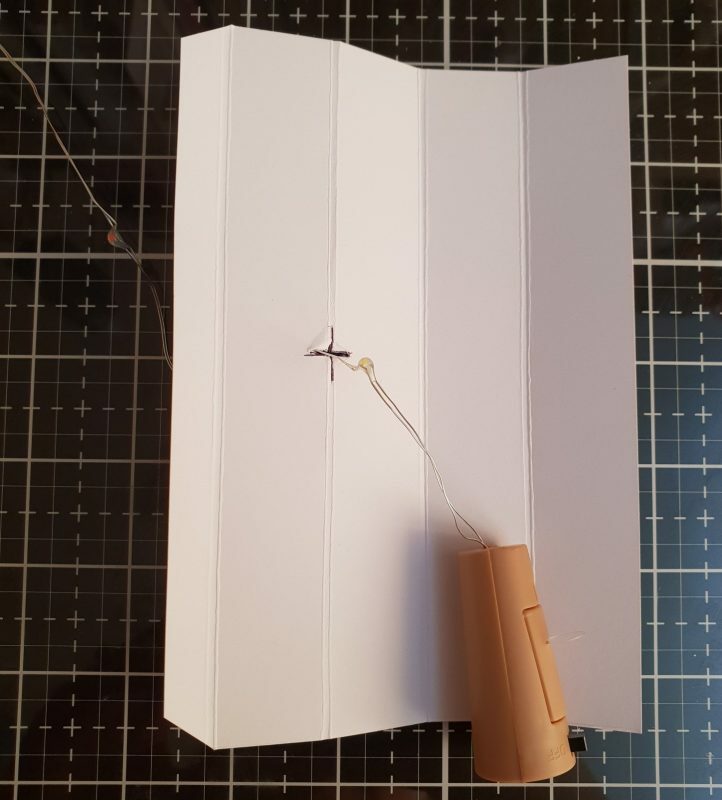 Don’t worry if your cut line looks messy when it has been stuck together, you can always hide this with card when the card is complete. TOP TIP: Make sure when you stick the section together you have enough wire for the switch to be able to be accessed (See picture). If this is not left you will struggle to turn the card on and off. 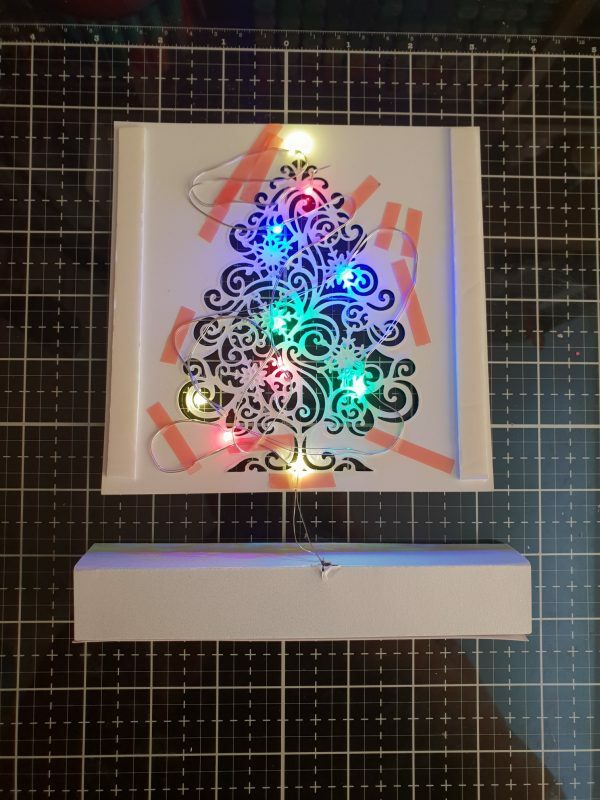 Now that you have stuck the box together you should have a panel you need to add the lights to the tree. 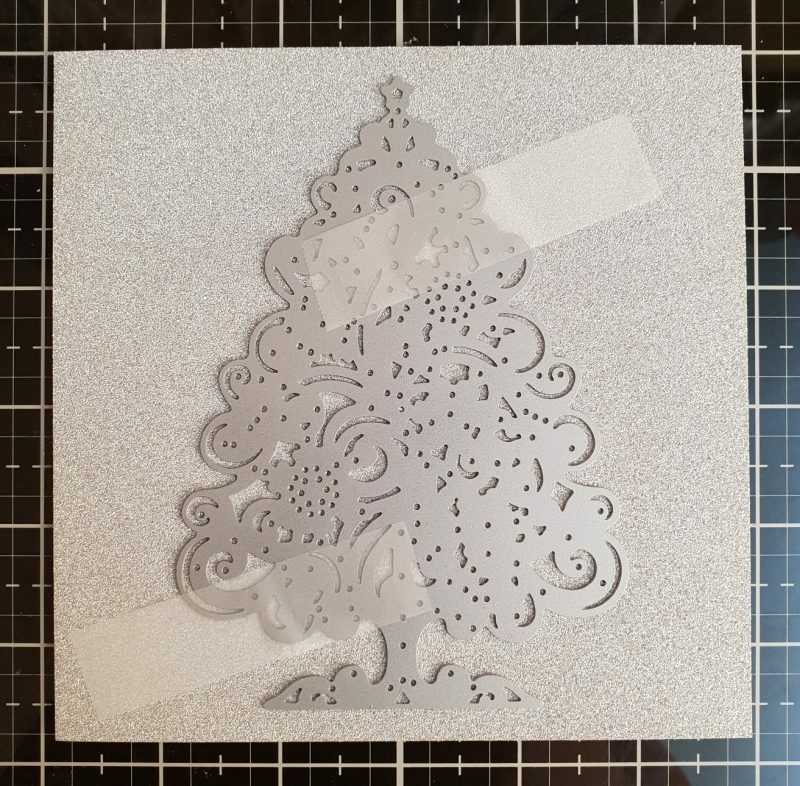 Start by lining up the bottom of the tree (as shown) and leave an approximate gap of ¼ inch between the box and the card. Make sure at this point, before sticking down, that the switch is still accessible. Stick the bottom of the lights to the base of the tree and the end of the string of lights to the star on the tree. I found red liner tape best for this. I found this next part of the card easier to complete with the lights on. If using multi-coloured lights it makes it easier to see the distribution of the colour. Secure the rest of the lights in place with red tape and be mindful to place them where there are gaps in the card. 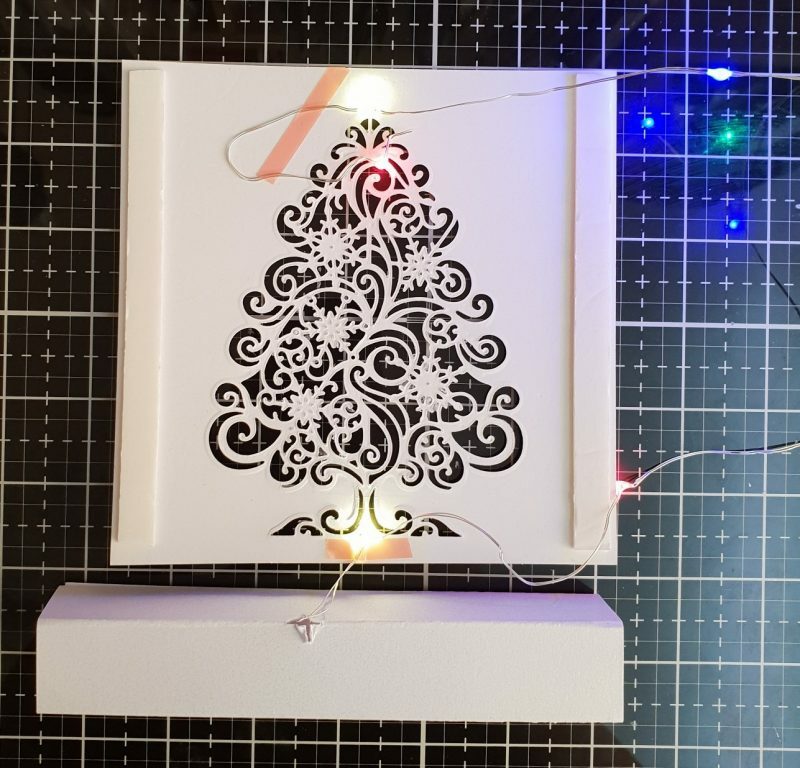 Now that all lights are in position you then need to add foam tape or 3D gel in the spare spaces to ensure the card does not bow in the middle. You can now stick this to the other matt. I find it easier to complete it this way than directly to the card. 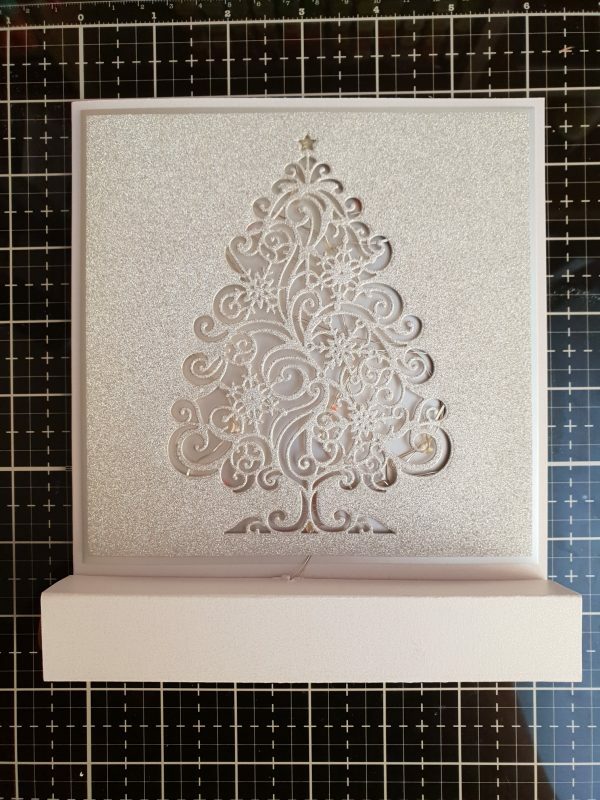 Stick the tree and the box element to the card blank. The box element should have no gap at the bottom. 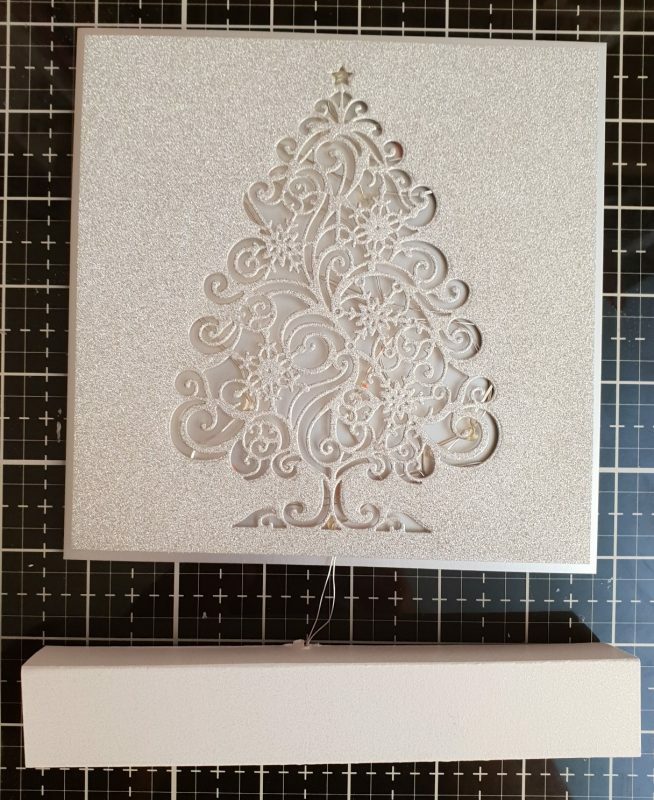 The tree matt should leave a border of approximately 1/8 inch around the edge. 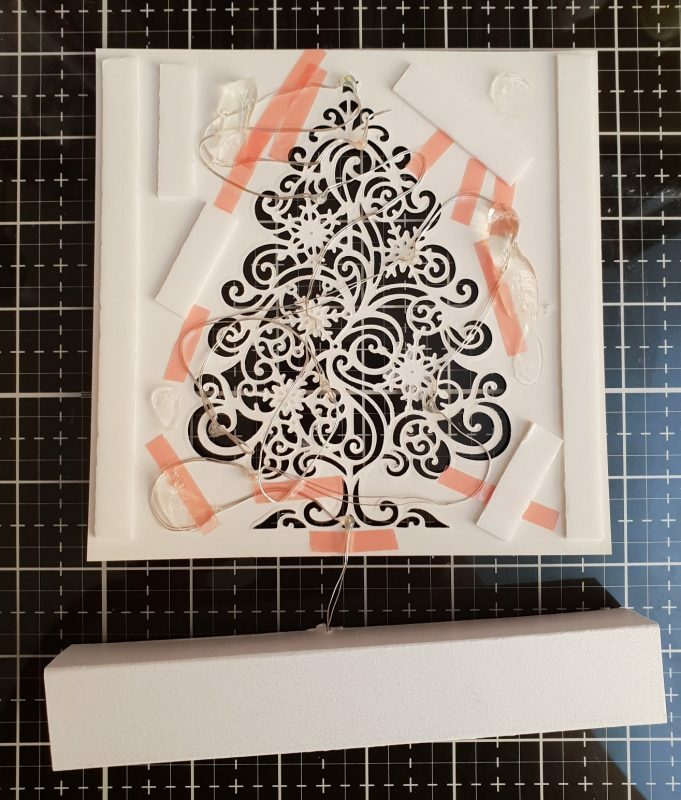 You can now decorate the box with strips of card or sentiments. You could even add smalls presents to the bottom of the tree. 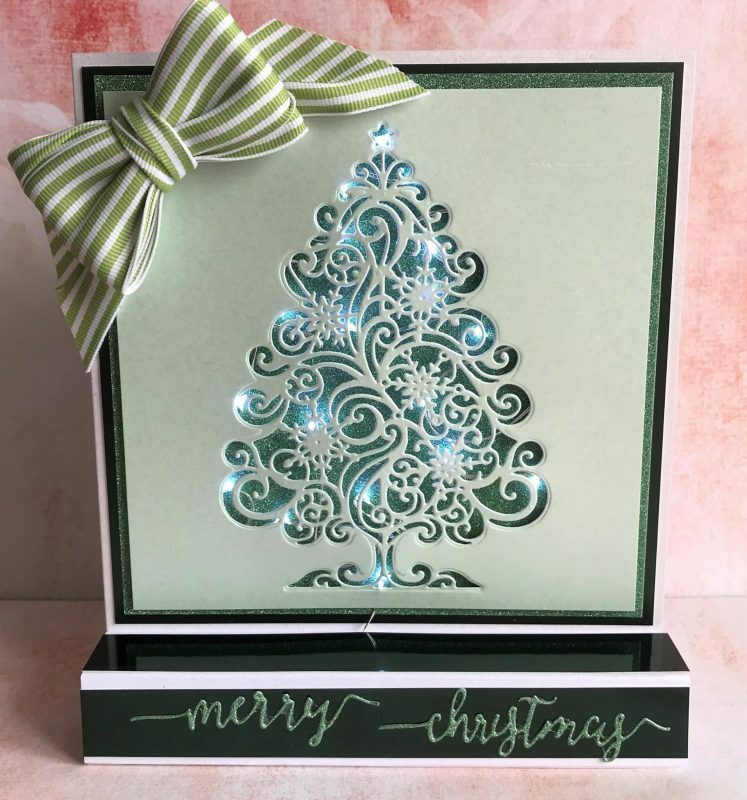 Try changing the colour of the lights or the colour of your card stock to give different looks. We hope that you have enjoyed this project?